Happy New Year and welcome back to the College! 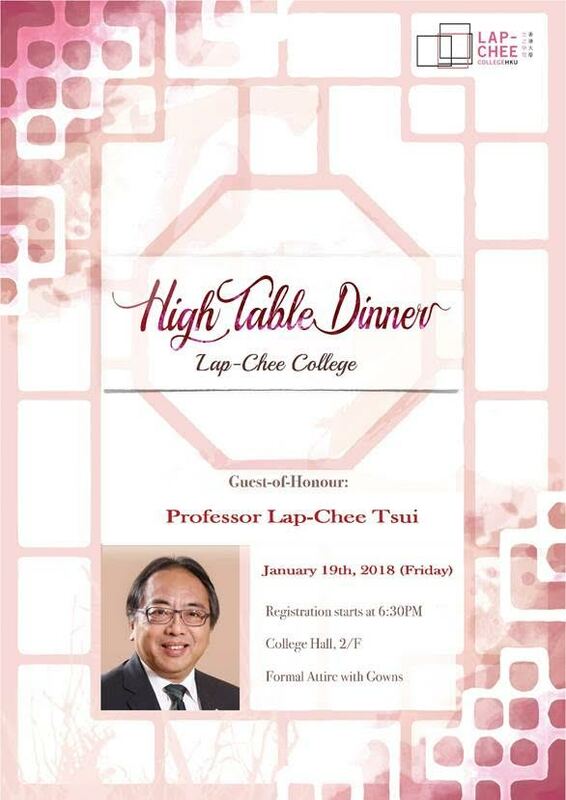 Please be reminded that the upcoming Lap-Chee College High Table Dinner will be held on Friday, 19th January 2018. Latecomers after 7:00pm will be considered as absent without prior approval. Formal attire with gowns. Students who do not dress according to this requirement will be asked to leave the College Hall and will be regarded as absence. New Lap-Cheers can collect your gowns on Jan 18th (Thursday) from 10:15pm to 10:45pm in Studio, 3/F. As this is a mandatory event in Lap-Chee College, students who will be absent, late or require early departure due to classes should write tolapcheecollege@hku.hk with valid proof, and also inform your floor tutor before Tuesday 16th January 2018. Any absence without prior approval will be issued with a warning letter. Vegetarians can collect main course tickets at the registration counter. Residents can send questions to Guest-of-Honour, Professor Lap-Chee Tsui via the link:https://goo.gl/forms/JllONfF9CyGEh6vN2. Born in Shanghai and raised in Hong Kong, Professor Tsui is known for his research in molecular genetics and his contribution to university education. He received international acclaim in 1989 when he identified the defective gene that causes cystic fibrosis, which is a major breakthrough in human genetics. He has also made significant contributions to the study of the human genome, especially the characterization of chromosome 7, and, identification of additional disease genes. His work paved the Human Genome Project and the HapMap Project. His early research involved the assembly pathway of the bacteriophage lambda and regulation of crystallin gene expression in mammalian lens. He has 300 peer-reviewed scientific publications and 65 invited book chapters and papers. Professor Tsui was the fourteenth Vice-Chancellor of the University of Hong Kong (HKU). During his tenure from September 2002 to March 2014, he led HKU through a series of unprecedented governance and management reforms, human resource reforms, and strategic developments in research, teaching and learning, and knowledge exchange with society. Professor Tsui had devoted himself to building a strong HKU Family, garnering support from University members, including alumni and friends. Also instrumental to the University’s recent development was his tireless effort in encouraging philanthropy for higher education in the community. Prior to his appointment at HKU, Professor Tsui was Geneticist-in-Chief and Head of the Genetics and Genomic Biology Program of the Research Institute, at The Hospital for Sick Children in Toronto. He was also the holder of the H.E. Sellers Chair in Cystic Fibrosis and University Professor at the University of Toronto. Professor Tsui has served on the editorial boards of 24 international peer-reviewed scientific journals, numerous scientific review panels, and many national and international advisory committees. He received honorary doctoral degrees from University of King’s College, University of New Brunswick, The Chinese University of Hong Kong, St. Francis Xavier University, York University, Tel Aviv University, University of Toronto, University of Aberdeen, King’s College London, University of Edinburgh, Fudan University and The University of Western Ontario. He is a Justice of the Peace of the Hong Kong SAR Government and has received the Order of Canada (Officer), the Order of Ontario, Knight of the Légion d’Honneur of France, and the Gold Bauhinia Star (of HKSAR).